The Precor 9.35 treadmill delivers premium performance for the most demanding home indoor runner. Along with the engineering to withstand rigorous daily workouts, this machine has the innovations and attractive modern design to be the centerpiece of any home cardio gym. Along with the readouts for speed, time, incline, calories burned, etc., the Precor 9.35 treadmill’s display also offers Time Remaining, Time in HR zone, Segment Time, METs, Percent Complete, and much more. The console also features Password Protection, Workout Log, a Pacer feature, a Biofeedback Center with SmartRate, and a Personal Best tracker. Wt / Dimensions: 335 lbs / 79" x 34" x 56"
UPDATE: The Precor 9.35 treadmill has been discontinued and is no longer available. Check out the latest Precor treadmills at the company store to find a comparable model on sale. Similar in layout to their club level cardio machines, Precor’s treadmills also feature a very user-friendly display and easy-to-understand readout. Among its 23 Programs are workouts for one-mile, 10k, 5k, heart rate, interval, random, weight loss, 3 run workouts, 3 walk, and 2 heart rate. In addition to the 15% incline, the Precor 9.35 has a negative -2% decline to mimic downhill runs. It comes with the Precor’s patented SmartRate® Heart Rate System, handlebar sensors, and wireless chest strap that help you monitor your working with accurate readouts while training in your Target Heart Rate Zone. As for its mechanical features, every component on the Precor 9.35 treadmill is made of premium quality including the 2.5" rollers, steel crowned drive system, 3.0 hp continuous duty motor, multi-ply belt made of polyester satin weave, and a reversible phenolic laminate deck. Two significant features to mention on the Precor 9.35 include the Integrated Footplant Technology (IFT) which adjusts the belt speed to your natural food speed. This built-in software monitors your heel strikes and adjusts the motor speed up to 100 times per second as you walk or run on the treadmill. The second advanced biomechanical feature is the Ground Effects® Impact control suspension system underneath the deck. The GFX technology adjusts the deck to your height and weight for a superior, low-impact running experience. 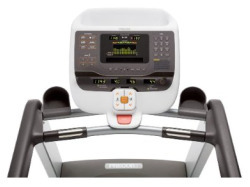 The Precor 9.35 is a well-built machine with the power, quiet operation, advanced foot strike technology, superior cushioning, challenging programs, quality components, solid warranty, and infrequent (if any) repairs needed. 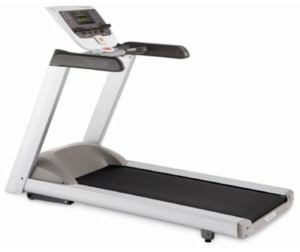 It is everything you could want in a first-rate treadmill – except for a competitive price tag. The Precor 9.35 carries an MSRP of $4,999 which many treadmill reviews cite as the only drawback to it; in fact, prices on all Precor cardio machines have climbed significantly in the past three years. 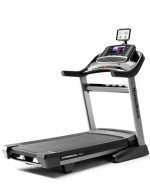 If you really want to spend this much money, compare the Precor 9.35 treadmill with a Landice L870 Home ProSports treadmill at $4,500, or the Life Fitness Club Series treadmill at $5,499, to see which one you feel will give you the best value in a premium treadmill.